ACHIEVE YOUR DREAM LIFE THROUGH FRANCHISING! Receive assistance to identify the right franchises for your situation and goals. Uncover the hidden opportunities you would not find doing your own web research. Get preferential treatment from high level executives and decision makers in the franchising industry. Uncover the true cost and potential of several well-known franchises. Get financing assistance to start your business. We are paid by all the franchises we work with, as recruiters, so our consultation is free of charge to you! 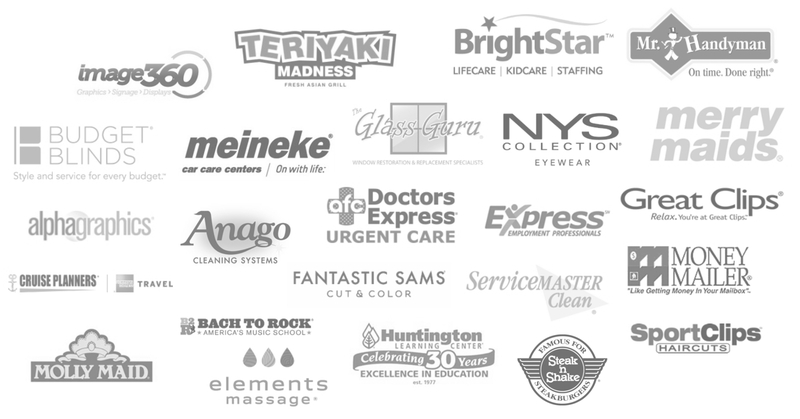 We work with over 500 franchises! 80 industry categories to explore! We want to define what the ideal franchise looks like for you, by considering a series of factors such as: your background, skills, personal and financial goals, business preferences, investment budget and more. We gather this information through our online questionnaire called "Personal Franchise Assessment". Alternatively we can over the questions on a phone call. We then perform our research across our entire Franchise Database to identify the best franchise matches to you. In addition to making sure the business model is the right fit, we also check to see if the franchise is available for new openings in your desired business location. We will go over the Franchise Selection in a presentation call (phone or video conference), and will explain why the business models selected are a good fit for your and will help you achieve your desired goals. We will also share our franchise selection file and other informations with you. As you decide to investigate certain models, we will introduce you to our franchise partners and help you perform the due diligence. This phase can take as little as 4 weeks or as long as months, it really depends on how fast do you want to move with the investigation process. It involves a series of phone calls with the franchisor, receipt and review of a Disclosure Document (including a copy of the franchise agreement for review), ability to interview existing franchisees, and in-person meeting at the franchisor headquarter (Discovery Day event). We will coach and help you during the entire process. IMPORTANT: investigating a franchise has NO COST and requires NO OBLIGATION. It is an EDUCATIONAL PROCESS, with intent to help you be fully informed about the opportunity. At the end you will be fully informed in order to make an investment decision (go or no-go). In case you decide to move forward (and you are also approved by the Franchisor) you will be awarded the possibility of joining the franchise. The Franchisor will present you with a final Franchise Agreement to be signed by both parties. FREE FRANCHISING WEBINAR - This Week! Last summer I was considering a transition from a corporate career to owning a business. I was introduced to Sheila through a mutual colleague. She was very well prepared for our first meeting where she presented a set of franchise options, explaining the pros/cons of each, and the opportunities available in my market. I had walked in with some trepidation as this was a new area for me but she put me at ease with her knowledge and professionalism. I decided to pursue the homecare franchise space and Sheila immediately helped me establish the connections needed to get the process started. A few months later, I signed on with a company and am now a proud owner of a local business. In addition to being available for me during the diligence process, Sheila has also been instrumental in helping me with resources to setup my business. Through her introductions, I was able to find a reliable attorney, an accountant, a landlord, and a recruiter! I highly recommend the services of franchise wizards for anyone new to the franchising world and needing a dependable guide through the process. I always thought about starting my own business, but was very lost as where to start…that was until I met Franchise Wizards CEO Sheila Purim. She was very professional and helped me through the whole process of identifying and starting my new business. I was surprised by how competent she was and how dedicated she was during the whole process, from helping share with me several options, to supporting me during the investigation phase, coordinate and help me during business meetings, and do benchmark comparisons. For anyone looking for help with business ownership, this company is sensational and I highly recommend!